Doom's SnapMap Update: A Modern Classic? Get it? 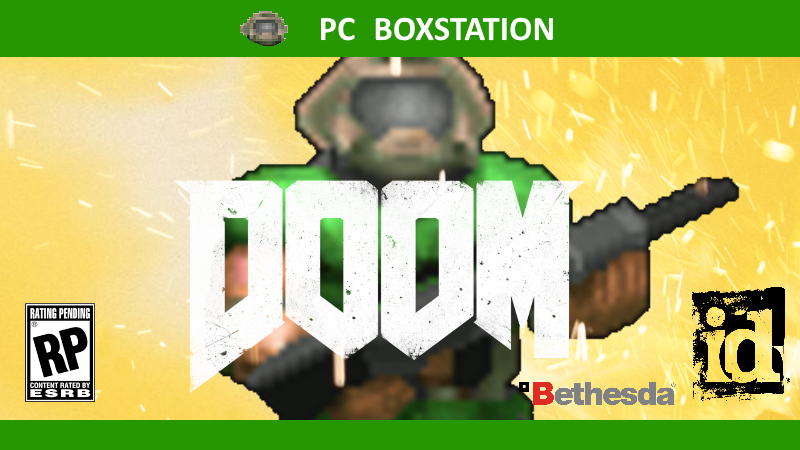 Because... because they added Classic Doom content? So if you haven’t heard, Doom recently got a new update with a fresh batch of free content, not only in the SnapMap mode, but (surprise!) in the actual campaign! The big update that had a lot of people in the Doom community excited (especially those who hated the multiplayer) is something called an Arcade Mode. If you’ve ever played any other game with a similar feature, you may be familiar with the concept; Players play through old levels in the game and compete with each other to get the highest possible score. Seems fairly standard. But Doom’s Arcade mode comes with two unique features. The less interesting feature is that maps now spawn a weird floating power core that you shoot to explode, causing a wave of devastation to all enemies in ts blast radius except to the player. Nothing really special to say about that. But the more interesting feature does turn things on its head a bit. Doom’s Arcade mode now has a lives system. At the start of each level, the player gets only a single life, though the further they progress the more they can collect. While the lives don’t, unfortunately, mitigate loading screens by having you spawn immediately where you were killed, they open up the campaign to a different dynamic. Previously the Doom campaign didn’t put a lot of pressure on the player thanks to a pretty generous checkpoint system - not that I’m complaining, given that the original even had save scumming. Now, not finishing the level before running out of lives forces you to the start of the level. It’s a great system, one that changes things around enough to make replaying the campaign again seem somewhat fresh. Even after being burned out on it after multiple runthroughs, it sparked my interest in running the campaign once more. It’s also pretty great that the mode lets has you skip cutscenes almost in their entirety. Sure, some of them still remain, but the particularly long and pointless ones, like the talk in Hayden’s office, are entirely erased. Given that the game had no story to speak of, it makes things a lot more thrilling and fun to be played this way. In addition to that, it comes with a restriction as well, but it’s all the better for it really. You can’t run every level with every weapon unlocked, meaning you’re no longer overpowered if you run earlier levels after beating the game (even if you suddenly have access to all runes, maxed out). Instead, each level has its own weapon “loadout” (don’t worry, you carry more than two weapons unlike the multiplayer) that mimics the weapons you would be carrying at that point in the campaign. I’d have much rather started each level with a pistol and be forced to find better weapons later on, but the balance this provided certainly provided me with some thrills. I forgot how much harder the earlier levels are without the BFG. Arcade mode does suffer from having gratuitously giant score font, however. I’m not exaggerating when I say these numbers will cover your entire screen. They really will cover your entire screen. Entirely. Sometimes for extended periods of time. Presumably it’s to make scoring higher points feel that much more exciting, because scores without multipliers are considerably smaller in font size, but as a result it only ever becomes annoying, not rewarding. I’m not a person who’s easily annoyed by font, either, as my general indifference to Comic Sans will tell you. Moving on to my personal favorite part of the update, SnapMap’s got a lot going on. The most prominent addition is the old-school “classic” content, including snappable level modules. The modules, themselves, are actually rather disappointing. Most of the modules included are just portions of actual Doom 1 and 2 maps, and not that faithful of a recreation, either. There are some clever ones that use the UAC modules redone in classic form, but that novelty wears thin quickly, on top of which there aren’t that many to go around. However, that pales in comparison to a major feature that has been added: Players can now put down walls with actual textures, not only from Classic Dooms, but also from the new one. The results are actually pretty insane. Even with the ability to mix around modules with props and windows to keep things fresh, SnapMap always suffered from being a bit same-y. Familiar. But the textured boxes (literally just boxes with textures in them), for all their simplicity, now open up a whole new range of possibilities which not only give you further customization options for existing modules (such as the actual ability to create outdoor levels) but give the player the capacity to basically create their own modules altogether. While this applies to the modern Doom assets, it particularly shines with the classic ones. Already I’ve seen a plethora of levels which use this ability to the point where they create entire levels which hardly use a single pre-built module, or are so far customized you would never know if they did. The real kicker is that despite SnapMap being far more limited than modding even now, most of the levels the community made in SnapMap are actually somehow better than most of the popular map mods I played in the classic Doom, and even with the modern guns and assets manage to capture the essence of the first Doom’s flow better than those mods could ever hope to. Which is weird because despite the addition, SnapMap still has a lot of restrictions in place. Most notably, the textured boxes lack waypoints for the AI, meaning even if you force them to stand on it, they’ll never move, and sometimes they would even bug out and refuse to attack. This makes making levels with elevation particularly challenging. Most players are working around this by disguising existing modules in a process I can only describe as black magic. I do wish that we could have had enemies skinned to model the classic Doom enemies, but the game does have classic Doom sounds for monsters, as well as a classic Victory screen (although the amount of SnapMap programming to get either to work is ludicrous). That’s in addition to, of course, some classic Doom music, which is always welcome. Although I would have liked to hear those tracks remixed with modern instruments. SnapMap has certainly come along way since launch, and definitely became a far better experience than I ever could have anticipated, especially given my less-than-lukewarm impressions during my review. I come back to it almost on a daily basis now, if not more often, and I’m frequently pleasantly surprised by the community output now with all these new features. Also, they brought in the berserk pack. Have you checked out SnapMap recently? Did you find any maps which impressed you?